Above: Vic Forsythe’s comic strip that appeared in the October 1924 issue of Fawnskin Folks. In 1920, he built a small studio on a hill in Fawnskin. The cabin made news when a reporter climbed over 108 rickety steps to reach the front door. A native Californian, Vic was raised on a ranch in the Coachella Valley and during his childhood his parents shared many of their vivid stories from the Wild West in Tombstone, Arizona. 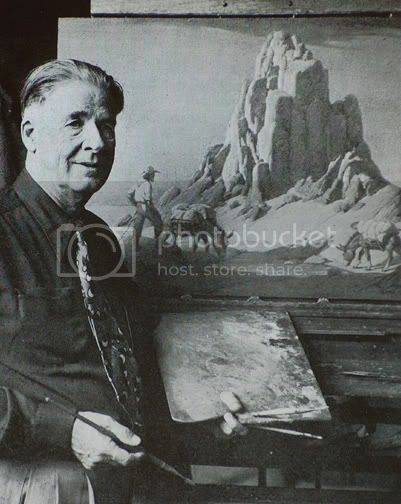 From these tales he developed a life long interest for prospectors, deserts, ghost town, and even burros and his drawing and painting of these subjects became his passion. Around 1903, his artistic desires led him to enroll at the Los Angeles School of Art and Design (the first art school in Los Angeles). Vic’s teacher, Louise Garden Mac Leod was well known for her art instruction and had trained under the famous painter James McNeill Whistler, most known for his creation, Whistler’s Mother. Under that tutelage he refined his drawing and painting skills. Vic created a unique style by drawing carefully placed triangles in charcoal, a theory he called “Dynamic Symmetry.” After the placement of these triangles, he would start to paint the landscape. In addition, he developed a unique method of painting clouds and sky that would identify each of his paintings. In 1904, encouraged by his teacher he took the train to New York to pursue a career in art. Above: Victor Clyde Forsythe undated photo courtesy of the Bodega Bay Heritage Gallery where you can view one of the paintings attributed to him. While in New York (1915), Vic became friends with an unknown artist, Norman Rockwell and they shared the barn of Frederic Remington. The Post had published some of his illustrations published and so he urged Norman to create drawings for the publication as well. The magazine is better known today as The Saturday Evening Post. Under Vic’s guidance Rockwell created and sold both of his paintings to The Post and a life long friendship began between the two artists. Vic achieved fame as a comic strip illustrator in New York but in 1920 he left New York with his wife Cotta and moved to California–splitting his time between Alhambra and Fawnskin. It was their invitation that prompted Norman Rockwell to also come to California. The comic strip artist continued to write his strip Joe Car (later named Joe Jinks find more here) from both of his homes. Joe Jinks was popular from 1918 through 1933 when Vic began illustrating Way Out West. Left: “Storm Clouds Near San Jacinto” De McCall collection in Bellflower, California. During this time, Vic and his friend Frank Tenney Johnson opened an art studio at the Los Angeles Biltmore Hotel. Soon their studio became the meeting place for famous artists such as Charles Marion Russell and Ed Borein. In 1938, Forsythe retired from the comics and focused on his first passion the American Desert. The artist often traveled from his Fawnskin cabin down Cushenberry Grade to Lucerne Valley to sit at the prospector’s campfires in the shadow of ghost towns and listen to their stories. Vic’s paintings became very popular and were in high demand. Some of his closest friends in Fawnskin received his special paintings as gifts. Vic Forsythe experienced Fawnskin as a place of friendship with beautiful scenes for all the senses, but more importantly as a place of inspiration and peace. Thank you for reading this post. 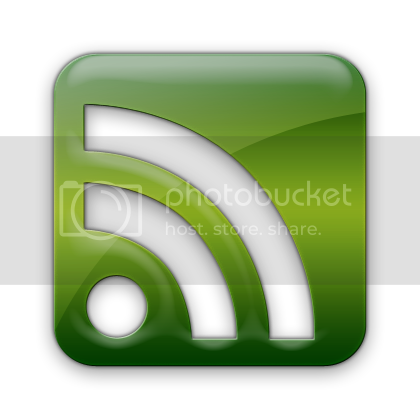 You can now Read Comments (6) or Leave A Trackback. This entry was posted on Friday, August 1st, 2008 and is filed under Fawnskin Folk, Fawnskin History, Mountain Lake Resort. Thank you so much for this! I’ve been looking for a art teacher/mentor; my passion is clouds and skies; perhaps Vic was a distant cousin, and can teach me through his example! I shall look for collections of his paintings and comics. Any information you could share with me would be greatly appreciated! Thanks for visiting. Most of the info is listed in the article. Vic passed away in 1962 but perhaps his inspiration will help you. Please ask for my personal email. I have much more to share. 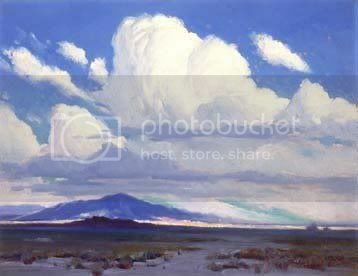 I spoke with another desert artist, Bill Bender, who was a friend of Clyde’s and he shared a great deal more information. Just a side fact, Clyde and his wife Cotta, were very close friends of Walt Disney. Before Disneyland opened to the public they went for a tour. The horses for the trollys were not at the park, so Disney had his employees push and pull them down the main street, and that was the first trolley trip. Hi, Eileen. Are you going to write a sequel to this post? That would be the best way to share it. My family owns the cabin in Fawnskin that you referred to in your article. I’ve become a fan of Clyde Forsythe as a result. He wrote in the doorway of the main cabin and the artist studio the date and time and drew a picture of the main character from Joe’s car. Would love to hear what other information you have on him. Hi Bill, I’ve alerted Eileen to your comment. Hopefully she will answer you with another article.